Two labourers Of M/s HCC Ltd constructing Pare Dam Kabiraj Tamang 20 yrs & Purna Limbu 20 yrs had been drowned in the river Pare near Sopo when they have gone for taking bath about 17 KM US from Doimukh , informed by SP Papum Pare Timme Amo. Doimukh ps staffs along with staffs of M/s HCC Pvt Ltd conducted search operation under the active supervision of Tumme Amo SP Papum Pare. However it was stopped due to darkness as nothing was visible in the river which was already muddy. However the search operation continued since morning today with the help of SDRF,Chimpu. 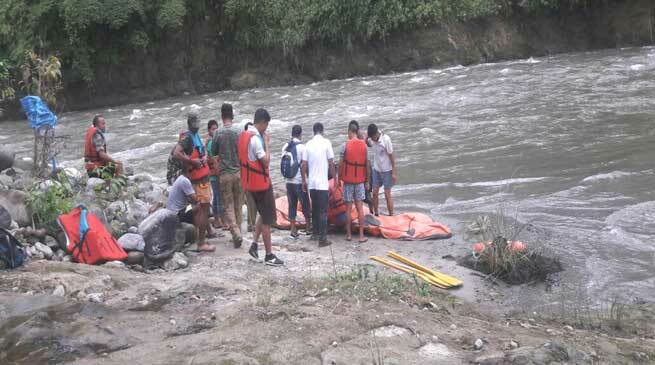 One dead body was retrieved from the river bank near Emchi about 3 KM from Doimukh towbship at around 10 am and was identified as Kabiraj Tamang. Kabiraj Tamang hals from Nepal and had had been working as Labour at M/s HCC Sopo for construction of dam. A UD case has been registered at Doimukh PS No.10/17 U/S 174 CrPC. The body was sent for PM examination at TRIHMS Naharlagun and later handed over to relatives and M/s HCC company staffs for last rites. Amo said that search operation was continued to retrieve the missing boy Sri Purna Limbu but as night fall started it was to be stopped as nothing could be visible. In an effort to retrieve the missing boy all sources have been alerted including OC PS Banderdewa I/C Harmuty Assam OC Bihpuria and nearby people of Dikrong river.. The search operation will continue tomorrow. In the meantime Amo appealed everyone to refrain from going to the rivers especially Pare/Dikrong and nearby tributaries for any kind of purpose or work and not to take bath as these days due to incessant rain the rivers are flowing above danger level. Further all parents in the capital areas are requested not to allow their children from going to river for swimming or picnic as all the rivers are dangerous and swollen up with very strong currents. Moreover, large amount of water is released from Ranganadi Hydro Plant to Pare river causing instantaneous sudden rise in water level and has drowned many persons in last few years.